for Model Codes and Standards. 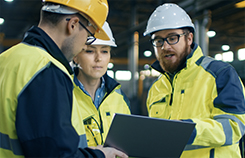 The International Code Council (ICC) is a non-profit organization dedicated to developing model codes and standards used in the design, build and compliance process. The International Codes (I-Codes) are the widely accepted, comprehensive set of model codes used in the US and abroad to help ensure the engineering of safe, sustainable, affordable and resilient structures. All fifty states and the District of Columbia have adopted the I-Codes® at the state or jurisdictional level. The International Code Council uses a governmental consensus process to develop its codes. It is an open, inclusive process that allows input from all individuals and groups. Committees hear all code change proposals. Final decisions are made by ICC Voting Members – Governmental and Honorary Members – who, with no vested interests beyond public safety, represent the public’s best interest. An appeals process allows anyone to appeal a code change. ICC makes model I-Codes and standards available free online as a service to the public. ICC’s digital code platform offers easy portability and robust usability including search, annotate, share, & more. Non-interactive PDFs offer a convenient digital option of the print books in the same two-column layout. Code is available in softcover, loose leaf, and hardcover editions varying depending on the publication. 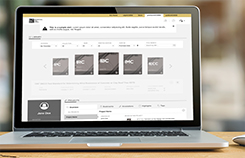 ICC premiumACCESS, PDFs, and print books are available for purchase in the ICC Store. ICC members receive discounts on these and other store resources as a benefit of membership. Learn more about member discounts, offers, free publications, and other exclusive member benefits and make a decision to become an ICC member today! Unlock the power of the codes with a live demonstration of premiumACCESS beginning April 17 at noon CST. Quickly find what you need within code using keyword search. 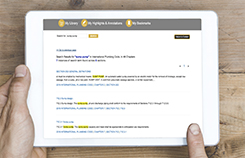 Find every occurrence of a word or phrase and tag the results of your research to easily find it later. premiumACCESS is completely portable. Interact with the code on your computer, tablet, phone or any device with a cell or Wi-Fi connection. Lighten your load! Highlight, bookmark, add notes, and even attach images within the code. Easily find your annotations later searching by project, subject or any tag you’ve created. Concurrent multi-user functionality makes it easy to share comments and questions within the same set of code. Share sections to others with copy and paste. Upon clicking Sign-Up, you will be redirected to the premiumACCESS™ trial page.